A school district’s mission and vision statements define and guide the work of the educational staff and the growth of the students. These statements are publicly visible, and serve as a pint of communication between central administration, teachers, students, families and community stakeholders. 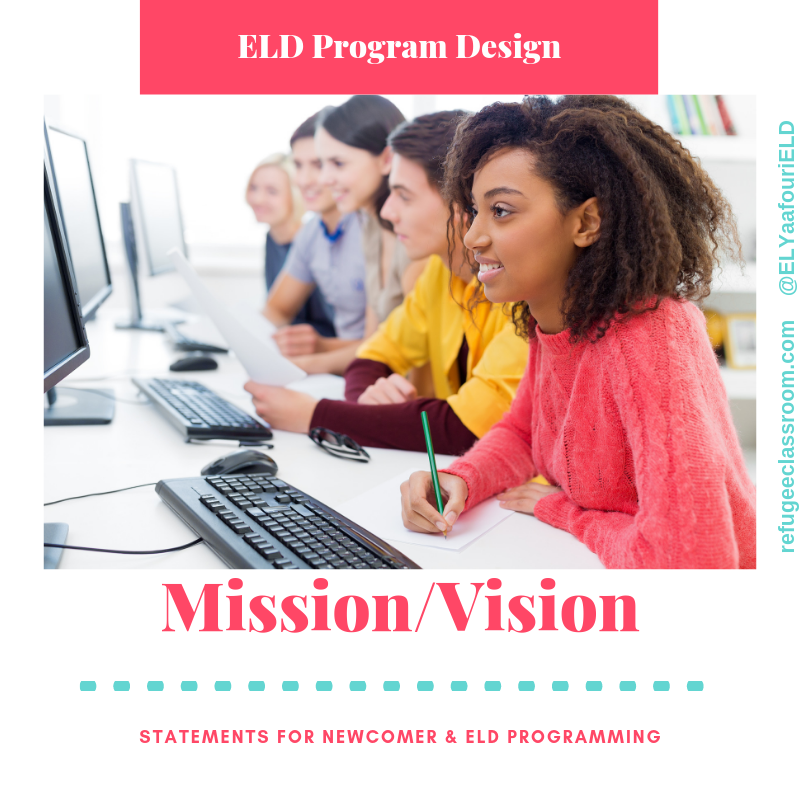 In most cases, districts and schools can also benefit from designing and implementing separate mission/vision statements that are unique to ELL and/or Newcomer programming, but that function alongside and in alignment with overarching district goals. EL/Newcomer initiatives that operate with clear, program-focused mission/vision statements are able to set goals, monitor progress and make critical decisions to promote socio-linguistic growth of its diverse populations. Great! So, where do we begin? The answer is, we begin where you begin. You- your school or organization- will begin this journey at a unique map point. You may model yourselves after other successful programs; and later programs may follow your lead. But, your school cannot walk step-in-step with another Newcomer-ELD education initiative. Why? Your school is not the same as any other school. Your specific student demographics are unmatched. Your team of educators- their personalities, strengths, opportunities for growth- are exclusive to your campus. Your team’s vision and goals and daily protocol are your own. Your children- the ones who stop to hug you on the way to the office, the ones you call to by first name for moving too quickly down the hallway, the ones you visit with in their homes on the weekends- these are your kids. Who knows your students and their needs best? You do. Who knows the capacities and limitations of your space, resources and funding? You guessed it. Your task is to craft- that is, to design and refine- successful Newcomer-ELD mission and vision statements that work for your organization, based on your particular set of ambitions, goals, needs and available resources. Mission and vision statements are cornerstones in determining your group’s purpose and function. These declarations help to ground and guide your team as a unified organism with a clearly defined cause. Mission and vision statements are more than formalities. In the case of Newcomer-ELD programming, they serve as a map that guides us, instructionally, in the direction of culturally-responsive EL student growth. Your mission statement defines what your group aims to accomplish in the present context- right now. The goals outlined in the mission declaration should be realistic and attainable. The vision statement outlines your team’s long-term objectives or ideals- your vision for the future. Google works to organize and make information accessible right now. Organizing data for the entire world is a lofty objective that will take time, but could actually be accomplished at some point in the future. Mission and vision declarations do not need to be complicated. In fact, simplicity is best. Ikea’s current mission is to “make everyday life better for their customers”. Current is emphasized because mission statements can be utterly static and should be revisited frequently as the team’s success or understanding progresses. Meanwhile, Ikea’s vision is, “to create a better everyday life for many people. We make this possible by offering a wide range of well-designed, functional home-furnishing products at prices so low that as many people as possible will be able to afford them.” The phrasing as many people as possible indicates a long-range goal, or vision, for the future. I bet you’re thinking, “That’s great, but why are we talking about Fortune 500 companies? We’re trying to get our Newcomer Centers and ELL programming off the ground!” Well, we can approach that very aim with a business-like mind for strategy, organization and anticipated gain (in this case, language acquisition, social integration and academic accomplishment). In this context, mission and vision statements are certainly applicable. Let’s examine some approaches in the educational realm. · To provide end-to-end education solutions in the K-12 segment. · To become a leader in the education services field. · To create comprehensive educational content that can be delivered through a series of innovative mechanisms, thus removing physical and cultural barriers in knowledge dissemination. HOW DO WE CREATE OUR OWN M/V STATEMENTS? First, gather your team. Mission and vision objectives are not one-man (or woman) shows. Make room for ideas to circulate. Open the floor. Disagree. Break thinking down and re-configure it. Decide what’s best for your team. Then, decide what’s best for the population you serve and override the interests of the team. This is a time for finding your organization’s core. All outward momentum will come from this center, so be sure it’s solid. (Or at least, that it is stable enough to bear the weight and stress of the current and future objectives you will set for your organization). · Who are we serving? · What are the precise demographics of the population that we are serving? · What do we want to accomplish? · What do we aim to provide? · By what means will we accomplish these aims? · How will our efforts enable student success? · Why is the student success we defined important? · How will we measure/determine success? · How will our efforts better our school and community? Next, elaborate on your values. What character traits, key ethics or primary goals does your organization consider sacred or essential to program success? How does or will your team maintain its integrity? Values encompass qualities such as leadership, partnership, innovation, safety, continuous growth and improvement, accountability, and professionalism. What does your team stand for? Now, begin to work together to invent (or revisit) your statements. There is no right or wrong way or any blanket format. Find what works best. You can start big (vision) and bring those ideas into clear, applicable focus (mission). Or, flip the process and move outward toward your team’s vision. Come back to your M/V statements regularly. To reinforce their importance, begin and end meetings with them, especially in the beginning stages. Remind each other to check in with your team’s core values throughout decision-making processes. Let your mission and vision define your team’s work. My mission is to empower educators to provide Newcomer ELLs and all students with the tools, resources and support they need to achieve their highest academic and social capacity. My vision is that all learners have an equitable right to high quality education and upward social mobility. All learners possess an ability to achieve greatness. All educators have an equitable right to training and support that enhances student growth. All teachers are capable of instructional excellence. What is your team’s mission and vision?